I had the most wonderful weekend with my quilty friends! There was lots of sewing, lots of great conversation, lots of laughter, and lots of good food! So, what did I accomplish this weekend? I finished my king-size Loops of Love (aka Single Girl) quilt top! I worked on this monster almost non-stop from Thursday night until Sunday afternoon. I'm just thrilled I was able to finish this top in one weekend! I still need to add the white borders to the top and bottom edge, but then I'll ready to sandwich and quilt. I used the entire line of Katie Jump Rope and mixed in some Flea Market Fancy. I love the way it turned out; those two collections seem to be made for one another. I really want to hand quilt this behemoth, so it may be a while before you see it finished, but I'm anxious to get started. Are you making a Single Girl quilt too? Check out the SGSG on flickr while I go order a really big piece of batting. Wow, Congrats!!! That is quite the accomplishment. Handquilting sounds just right. WOW WOW WOW WOW, it is beautiful and you got it done in a short turnaround. It is so so krisp. What kind of white material did you use, solid.? That came out awesome! I'm so excited to see that you got it done quickly - who needed more than a week?! :) Did you use the curving foot? If so, how did it work? Stunning! You must be tickled pink to have the top made in one marathon sewing weekend! Just GORGEOUS!! I've seen lots of the Single Girl pillows on blogs, but never as a whole quilt. It looks great! Where will you use it? Congrats on the beauty and enjoy!! That looks beautiful, love the two fabric lines together. I'm in the midst of piecing rings for a baby quilt size for imminent baby number two, and I hope mine comes out half as perfectly as yours. The quilt is wonderful, but I really love the background in your photos...the old car & buildings. Can you tell us where the photos were taken? It's beautiful and would be great hand quilted! How wonderful! It looks fabulous. So great you had a marathon sewing weekend. That is just beautiful! I can't believe you pieced all of it in one weekend! Congratulations on your accomplishment! Oh, this is one of the most gorgeous quilts I've ever seen! 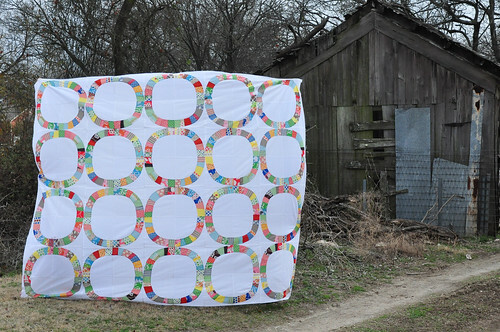 I am having some serious quilt envy! It is going to be so beautiful! Amazing! It looks stunning. Way to go!! Holy crap, Mel, you're my hero!! Beautiful! You are amazing!! Shucks... I still need to cut my SG pieces out! Great, great job! It's absolutely beautiful!!! that quilt will be wonderful, great job!! "I only accomplished one thing"...and it was huge and very very difficult! So nice to visit with you this past weekend. wow, this is absolutely gorgeous! you must be so pleased! Wow Melanie! WOW! you must be so thrilled :) it's looking incredible! Wow, Melanie, it's so so so beautiful! The fabrics, the Single Girl design, your curves... it's just gorgeous! Well done! Wow! That's impressive! And such a beautiful quilt. I hope one day I will be ready to try this pattern. I am collecting katie jump rope and flea market fancy fabric just in case. I canNOT believe you did a king size! I have been cutting (and cutting) and have nine rings cut and nothing sewn yet. I was going to do a combo of FMF and KJR, but ended up going with Hope Valley for nine rings and coordinating solids for three rings, with some solids thrown into the prints just here and there. 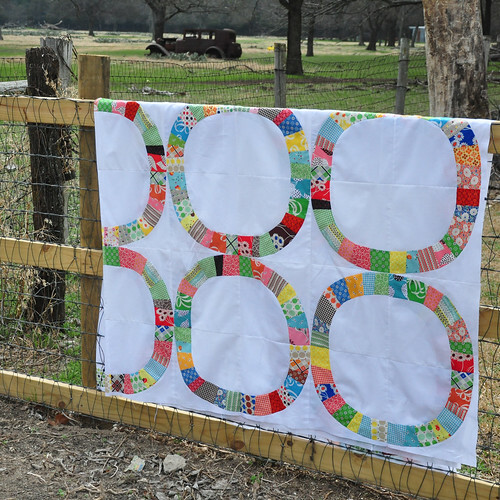 Your quilt top is gorgeous!!! this is beautiful! you must have had some serious focus to finish this in one weekend. these single girl quilts look like so much work. how do you plan to quilt it? Greetings from New Braunfels. You did an amazing job!! 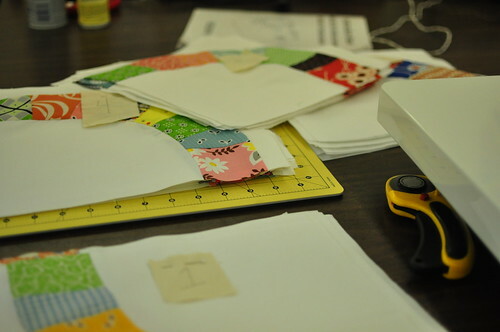 I invite you to visit my most recent post, kaholly, to learn how, as a quilter, you can help Operation Homefront-TX. Thanks!